Day or night, our home should be a place where we feel safe to enjoy our family and friends. We want to relax with a sense of peace, away from threat and danger. Installing a home security camera system is one way to feel safer at home, and with the information below, you will be prepared to choose between a wired system and a wireless one. By contrast, wireless cameras, the most common type used in homes, are quick and easy to install. The installation is often done as a DIY project. The wireless cameras connect to their central system by radio waves. Most will, however, have a wired connection to an electrical source. Otherwise, they would be battery-powered, an expensive option that requires changing and/or recharging batteries regularly. The cameras can be placed anywhere inside or outside the home, as long as they are in the range of the central unit. They can also be repositioned if needs change over time. The materials cost of a wireless system is usually higher than the materials cost of a wired system, but the cost of professional installation makes the overall cost of a wired system greater. One way to reduce the cost of a camera system may be to sign a contract with a security monitoring service. This can save hundreds in installation cost. If not free, the cost for installation with a contract may be $100 or less, regardless of the type of camera you choose. A professionally-installed, closed-circuit system can cost between $1,000 to $8,000, with the average cost being $4,000. This is an all-inclusive price for a four-camera system, central monitoring and recording station, and all necessary wiring. Doing the job oneself would cost you approximately $500 to $2,000 in basic materials, and the installation cost will be double to four times the cost of equipment. The cost for a wireless security camera system will be less because of the reduced requirements of the installation. Camera prices vary from $100 to $950 each. A network attached storage device or DVR with up to 4TB of memory will be about $499. The price of this unit will vary by the TB capability. A professionally-installed, four-camera wireless unit will cost around $1,158, $818 for materials and about $340 for installation. Wired systems rely on a battery backup system during a power outage. Wireless cameras connected to the home’s electrical wiring should also have a battery backup for use during an outage. This can be a battery in the unit, preferably a rechargeable lithium-ion battery pack that will be long-lasting and eco-friendly. The hardwired system used with wired cameras sends power to each camera either through electrical wiring or power over Ethernet 1 wiring (PoE). Therefore, these cameras do not need to be placed near electrical outlets. If the connections of a wired system are run through the walls, this creates the most pleasing appearance, but this is a difficult task in a retrofit installation. In this case, a wireless system can be less intrusive and provide a better visual effect. 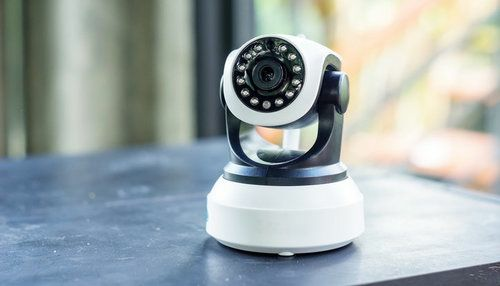 The cameras of a wired system tend to be more difficult to conceal because of the wired connection to the home. A wired system of security cameras allows for several protection zones, and this type is a better choice for a large home. Wireless cameras, on the other hand, trade portability for a limited range. They can be installed in a variety of locations but must be placed within the home’s WiFi range. Through the use of repeater units, the range of installation can be extended further, but they are still better suited for smaller homes, apartments, and condos. The wireless camera system is more user-friendly because of the capability of Internet access. If the system is connected to the Internet, the feed from the camera can be linked to phone apps or outside computer programs via a simple interface for remote monitoring, allowing the home’s residents to see what is happening when they are away. Higher-end cameras allow the viewer to control the camera from another location, such as pan, tilt, or zoom. Having Internet access also allows the camera system to be integrated into wireless home security and home automation systems. At one time, wireless cameras were superior to wired cameras in both video and audio quality, but now the resolution of a wired camera can be equal to or better than a wireless camera, depending on the features of the individual unit. A camera’s resolution is measured in two ways, depending on whether it is an analog or digital camera. Wired and wireless cameras can be either digital or analog. An analog camera’s resolution is measured by television lines (TVL) or by the number of horizontal and vertical pixels. For example, a high-resolution analog camera would be 700 TVL or 960H x 480W. The resolution of a digital camera, on the other hand, is measured in megapixels (MP). An example of a high-resolution digital camera is 1.3MP. The key to understanding both types of measurements is that, within its type, a higher number always means a higher resolution and therefore a clearer image. A wired system does not allow signal interference from wireless devices nearby, but a wireless system does. The only interruption possible with the circuit of a wired system is the cutting of the connecting wires. Doing this triggers an alarm signaling that the circuit has been broken. The circuit of a wireless system, on the other hand, can be disrupted by jamming or interference. Wireless jammers are available for purchase online, and an alarm may not signal that jamming has occurred. In addition, the wireless system operates in the same radio frequency spectrum as a variety of other wireless devices, including cell phones, car alarms, baby monitors, radios, and cordless phones. Interference can also come from the home’s structure, bad weather, sunspots, or proximity to power lines. These signal distractions can interfere with the home’s security cameras, causing loss of signal or other malfunctions. Again, an alarm may not alert the residents of this interference. Newer models reduce but do not eliminate these risks. If a wireless system is connected to the Internet to take advantage of remote and integrated features, hacking is another possibility. If the cameras are hacked, they can be remotely accessed by someone unauthorized to view and perhaps even manipulate the images. Good Internet security is essential to prevent this type of home invasion. Use a unique password and change it on a regular basis. If a wired system is closed and does not have access to the Internet, remote hacking is not possible. How much does it cost to install wired or wireless security cameras in my city? Cost to install wired or wireless security cameras varies greatly by region (and even by zip code). To get free estimates from local contractors, please indicate yours.